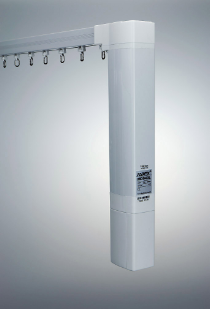 Electric Curtains have never been so easy to fit and operate. Motorise your Curtains with one of the Raex electric curtain tracks, made to your requirements. Choose from a range of Radio Control, Mains powered Battery powered or Heavy duty plus many more options and in most cases, you do not require an electrician. Do you supply curtains with the electrical curtain track? We only supply the motorised tracks and controls and do not supply curtains. You can use curtains, with ordinary hooks and if desired request our 80mm Wave system to give the uniform and balanced look. 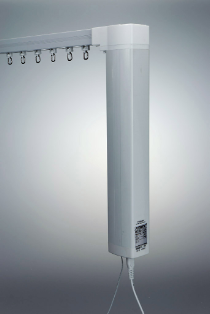 Can the Raex electric track pull and support Heavy Curtains? The MD360 model has a pulling capacity of up to 50Kg which can be increased to 90Kg when using a double motor system on Straight tracks for electric curtains. The MD950 model can cope with even more. This covers most domestic and commercial applications. How is the Track fixed in place? We supply adjustable wall fix brackets to cope with walls or bay windows that may or may not be truly square or a swivel bracket that is fixed to the ceiling. We calculate the number of brackets required and supply as part of the system. Additional brackets can be supplied if required. Will the hooks on my curtains work with the electric curtain track. A normal curtain hook will work seamlessly well with the track gliders. Please note that we do not supply hooks with the tracks for for electric curtains. Do you supply spare parts for the Electric Curtain tracks? Spare parts can be supplied if required, through the life of the system. Does the Track Length Include the motor? 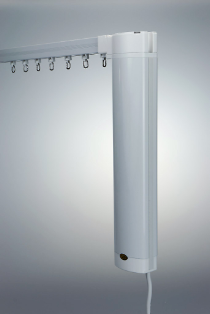 The electric curtain motors are included as part of the curtain track length but is hid from view by the curtain itself. Can I still open and close my curtains if I have a power cut? The MD Range of motors are designed to address exactly this kind of a problem. If you have a power cut the Electric curtains can be operated by gently pulling them in the usual way into the open or closed position. When the power is re-applied you just need to open and close them once to datum the system. Can the electric track be bent to fit my bay window or made into a continuous curve? We have supplied shapes of all kinds to our customers over the years from continuous curves with reverse bends to seven sided bays. We will require certain measurements and send you a drawing of what we are about to make before the electric track goes into production. The MD Electric Curtain Track range facilitates many types of application and can be controlled in several different ways. The battery option offers the benefits of a mains powered system but caters for the retro fit market where there is no power available, the 4 wire 240VAC system is used with hard wired switches or home automation control and of course there is always the remote control mains powered system. 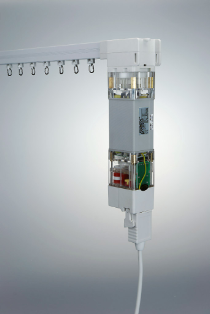 Most of our Electric Curtain track systems come with an RJ11 Dry contact socket which gives the benefit of connecting to a home automation system while still being able to be operated by the primary control. Having Electric Curtains has never been so easy and the benefits of a cost effective solution will not compromise the functionality of our Electric Tracks, see some of the features below.